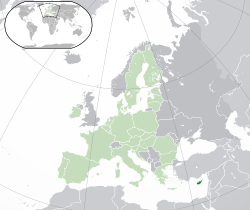 Cyprus proper shown in dark green; areas outside of Cypriot control shown in light green. ↑ 1.0 1.1 Including Northern Cyprus, the UN buffer zone and Akrotiri and Dhekelia. ↑ "Statistical Service – Population and Social Conditions – Population Census – Announcements – Preliminary Results of the Census of Population, 2011" (Greek में). Statistical Service of the Ministry of Finance of the Republic of Cyprus. 29 December 2011. पहुँचतिथी 29 जनवरी 2012. ↑ 3.0 3.1 3.2 3.3 "Report for Cyprus". World Economic Outlook Database. International Monetary Fund. पहुँचतिथी 17 अप्रैल 2013. ↑ "2013 Human Development Report". United Nations Publications. 14 मार्च 2013. पहुँचतिथी 14 मार्च 2013.